Dan Resin, the actor who played the Ty-D-Bol Man, has died at age 79. "Caddyshack" fans (and who isn't one?) will remember him as Dr. Beeper, but man, it's hard to overshadow his role as the guy in the little boat sailing around the toilet. My parents never bought the stuff and I never understood why -- it looked so cool to me as a kid when I'd go to a friend's house and their toilet water was BLUE. To a kid, that seemed uber-classy. Now it just seems kinda gross. I remember in "Retro Hell" one of the contributors says when they lost water in an earthquake, all their neighbors were coming over to borrow water from their toilet tank because they couldn't use their own--it was Ty-D-Bol tainted. 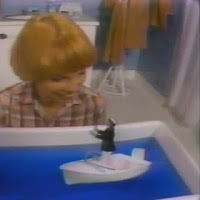 And I can't think of that little guy in the boat without thinking of a Carol Burnett Show skit (couldn't find the video -- can anyone?) where she flushes him. After a fun search, I found it. It's part of Carol's "Product Placement" skit. The Ty-D-Bol man goes for a ride about a minute into the sketch.